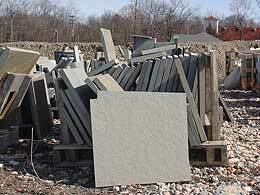 We carry a wide variety of natural stone to suit any landscape project. We encourage you to visit our yard to see all the varieties of stones available for your projects. 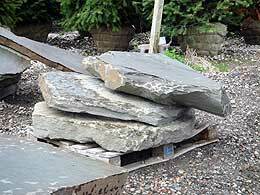 These rocks are cut into uniform pieces of varying sizes and used for patios, steps and walkways. 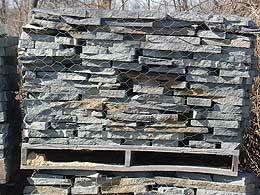 These types of rock are quarried into sheets of varying thickness and size for use in building walkways, paths, and patios, with or without mortared joints. 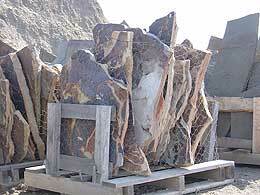 These types of mountain stone are all collected, sized, and palletized by hand. They are relatively square and flat on two sides, so they make the perfect material for building beautiful walls and ponds. You can build some low, non-retaining type walls without mortar (“dry stacked”). These rocks are hand collected. They can be used in mortared walls and water features. Available in pallets or by individual rock by weight.